This monograph begins to explore the complex and multifaceted nature of technologies that will extend the puzzle of reality to questions we cannot yet know to ask. 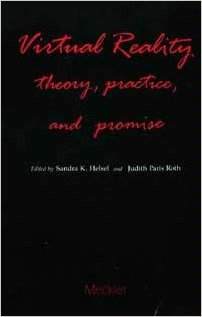 The cultural assumptions and epistemic categories embedded in the language/thought processes of various pioneers are certain to influence the future direction of virtual reality technologies. 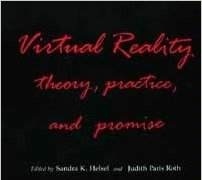 As for “learning the language” of virtual reality, the authors present comprehensive definitions of the field’s inherent philosophies, technologies and vocabularies. These essays have been organized into three basic sections: Section 1 concerns the theory and definition of virtual reality, Section 2 deals with current applications and development of virtual reality concepts and technologies, and Section 3 focuses on the promise of virtual reality in a variety of environments – the arts, education, training, and information storage and retrieval. In Section 1, Michael B.Spring examines how virtual reality systems may be applied to certain problems in information science; he offers an analysis of some problems with technology applications in the information science field. In addition, he attempts to define what is meant by the phrase “virtual reality”. Randal Walser from Autodesk, Inc., offers the reader a description of certain virtual reality emerging technologies. Bret C.McKinney offers readers an examination of the role these systems will play in virtual reality environments. His essays include a brief description of high-definition systems and a glossary of terms. Huntley and Partridge from the Computer-Assisted Instruction (CAI) Lab at the University of Iowa describe the development of Fluxbase, an application that integrates the Fluxus art collection with new information storage and retrieval functions using a NeXT workstation.